High end Vista living! Situated near the corner of Lady and Huger Streets for a super easy commute, this 2 bed, 2.5 full bath condo has 1700 square feet of living space and amazing views of the Vista. Prepare to be amazed the moment you step foot into this 4th floor unit at The Lofts. 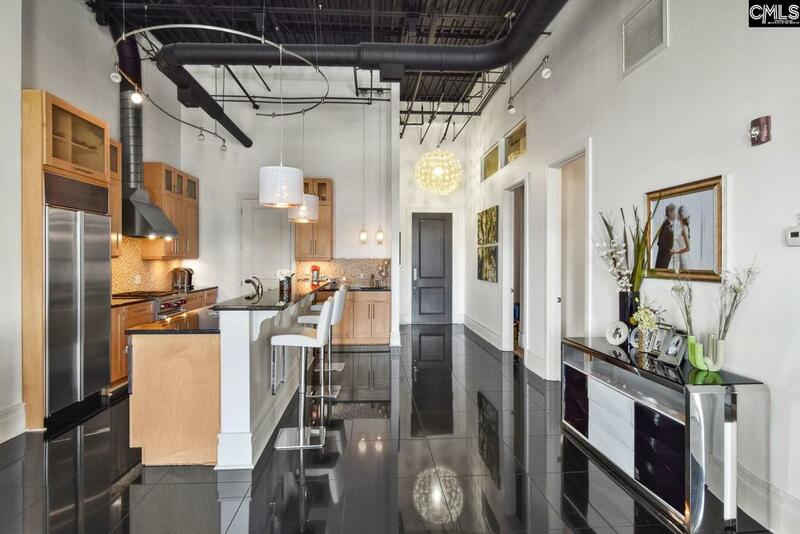 White marble flooring, and exposed ceilings & brick all lend to the sleek and modern look of this condo. The open floor plan includes a great room with a gas fireplace; the kitchen with custom contemporary cabinetry, sub zero refrigerator & a Wolfe gas stove, a bar and marble counters tops. The master suite features 2 walk-in closets, exposed brick focal point, hardwood floors and an ensuite w/ dual granite vanities, large soaking tub and a glass shower. There is great outdoor patio space, which can be accessed from the master bedroom and great room- this is where you find the breathtaking views! The HOA covers water, garbage and gas. There are two dedicated parking spaces and storage unit on the ground floor. Don't miss the gym on the 1st floor. An amazing property like this does not come on the market very often, so call us today to schedule your exclusive tour!